After his early days driving Ford Thunderbolts and building his reputation driving Larry Coleman’s Super Torino funny car in the late 60’s, Sidney Foster moved on to driving Mustang funny cars in 1970 with his brother Gerald’s fi nancial backing. In 1972, the loyal Ford Motor Company racers chose a Mustang Mach 1 body over a Logghe Brothers chassis with a supercharged Ed Pink built Chrysler 426 HEMI® engine and a 2-speed manual transmission. Campaigned under the name Gerald Foster’s King Cobra, the Gretna Louisiana brothers raced AA/FC division 4 in 1972 and 1973. During Gerald Foster’s ownership this car was driven by famous drivers Sidney Foster, Mike Martini and Frank Huff. In 1972, Frank Huff recorded a 6.61 quarter mile at 223 miles per hour in this car with Thomas Gorman as crew chief. 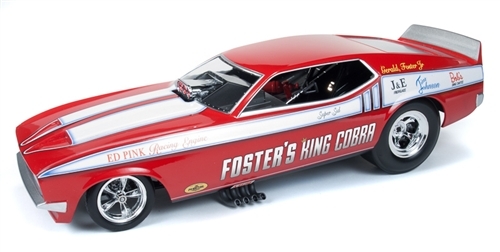 After the 1973 season, the Fosters sold the funny car and retired from racing.